Library image #33: National Historic Register Landmark Lighthouse built in 1868. The United States Congress designated the Huron Islands Wilderness (map) in 1970 and it now has a total of 147 acres (146.85 acres, technically). All of this wilderness is located in Michigan and is managed by the Fish and Wildlife Service. The Huron Island Wilderness is located on and makes up the entirety of the Huron National Wildlife Refuge. Created when President Theodore Roosevelt designated the small islands a national bird sanctuary to protect large colonies of nesting gulls, all eight of the Refuge’s islands are now managed as Wilderness. Of these islands, only Lighthouse Island is open to public access. The eastern most island is known as Cattle Island in memory of the livestock marooned there in 1860 when a cargo ship, the Arctic, ran aground. This incident prompted the construction of a lighthouse on the Lighthouse Island, also known as West Huron Island. The lighthouse was completed in 1868 and remains active within the Wilderness. 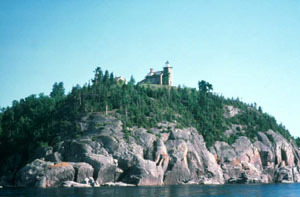 The islands are sheer granite outcrops which rise nearly 120 feet above the Lake Superior waterline (602 feet above sea level). In some areas the bare granite still shows deep grooves left by retreating glaciers, while in other areas the thin soil layer supports a ground cover with gnarled red and white pines, balsam fir, and white birch. On Lighthouse Island you will also find remnant plants from past light keeper’s gardens. Wildlife is scarce during the winter months, only snowshoe hare and small mammals are year-round residents. Occasionally, other mammals may wander across the winter ice to explore, but they seldom take up residence. However, the islands are critically important for colonial nesting birds and they serve as a resting site for birds migrating across Lake Superior. Some common species found in the Huron Islands Wilderness include: Eastern Red Bat (Lasiurus borealis), Snowshoe Hares (Lepus americanus), and the Double Crested Comorant (Phalacrocorax auritus). Four islands of Huron Island Wilderness are vegetated; the remaining islands are barren outcrops of granite. Vegetation surveys have documented 157 species of flora. The vegetated islands are generally characterized by shallowly rooted trees and exposed granite. Vegetation is a boreal transition type made up of balsam fir, white pine, red pine, white spruce, red maple, bigtooth aspen, and paper birch. The understory contains cherry species, balsam fir regeneration, Canada yew, various woody shrubs, grasses, and forbs. There are a few areas on East Huron that contain small sphagnum bogs with an occasional black spruce. Only West Huron, East Huron, Cattle and Gull Rock Islands have substantial vegetation. Visitors should expect cool temperatures in the 60s during summer months and below freezing in the winter (the average winter temperature being 17.2 degrees). The islands also receive 24.8 inches of precipitation annually. A half mile trail leads from the boat dock to the lighthouse and a 1 mile trail will guide you to the north end of the island. Planning to Visit the Huron Islands Wilderness? West Huron Island (Lighthouse Island) is open to the public during daylight hours. All other islands are closed to public entry.